Description: London, J.M. Dent & Sons & E.P. Dutton & Co. New York 1920 Decorative frontis and titlepage & endpapers in Art Nouveau decorated endpapers by R.L.K. (ie Reginald Knowles). . Small octavo orange ribbed cloth spine overall gilt (tips rubbed/spine gilt darkened) half title + Everyman catagories +doublepage titlepage +contents leaf +381pp +8p Everyman's booklist. 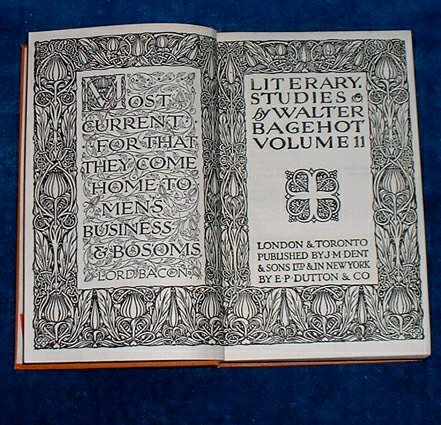 Contents include: Edward Gibbon, Sterne & Thackeray, Waverley Novels, Charles Dickens, Thomas Babington Macaulay, Mr. Clough's Poems, Wordsworth, Tennyson, Browning .. or Grotesque art in English Poetry + Appendix "The Ignorance of Man". Name Edna M. Orton to corner of fly leaf & small Foyles bookseller's label.